1. Pamidronate: In a series, this most commonly caused a collapsing FSGS, and a unifying diagnosis was a combination of malignancy and pamidronate within 1-4 years. Full blown nephrotic syndrome was evident in all. Fortunately, many had good response to drug withdrawal. 50% of cases have had significant improvement after drug withdrawal. 3. Interferon: Alpha, beta, and gamma. All are administrated IM or Subq. All can cause constitutional symptoms, cytopenias, and increased LFTS. Laboratory findings: Anemia, schistocytes, depressed haptoglobin, and elevated LDH. Post written by Dr. Kenar Jhaveri, eAJKD Blog Editor, and edited by Dr. Kellie Calderon, eAJKD Advisory Board member. 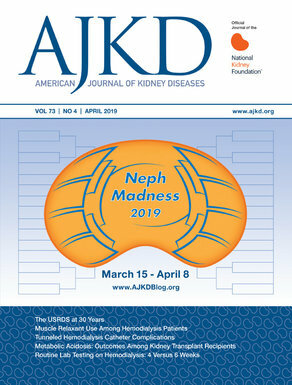 Check back for more eAJKD coverage of ASN’s Kidney Week 2012! Also, check out @eAJKD on Twitter for live updates!